Still a favorite with students and teachers alike, Skateway was reissued by Dundurn with this new, attractive front cover. Set in 1989, eleven-year-old Josie's life is falling apart one night when her father, fearful of his arrest, tells the family they are going to escape from East Germany. Becoming a refugee, Josie must leave behind everyone and everything that has ever mattered to her. After a harrowing escape they arrive at their final destination, Calgary. Here more difficulties confront Josie as she struggles to learn English, to adjust to a Canadian school, to make new friends and to find a way to continue her greatest pastime — skating. Students have been known to come up to Ann clutching Skateway and saying, "This is my favorite book of ANY!" Teachers have enjoyed using this book with their studies on Canada and new Canadians. This story is a must read for anyone interested in figure skating. 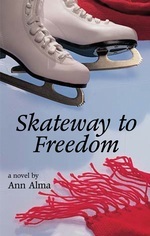 Skateway to Freedom was nominated for the Silver Birch Award, is an "OUR CHOICE" book, and was on the best-sellers list for months. You may want to read what others said about Skateway on the reviews page.